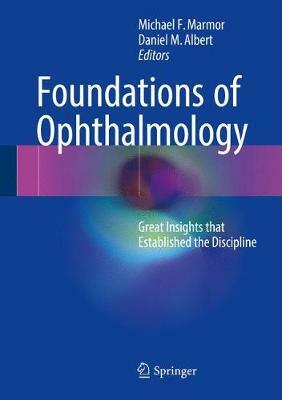 There have been books over the years discussing the history of ophthalmology, but none that focus directly on just the most critical thinkers whose insights provided the foundation for the discipline. These men and women advanced knowledge about vision, diagnosis, disease mechanisms, and therapy through innovative thinking and perseverance against old ideas. Their stories are intriguing at a personal level and for showing the complexity of advancing medical science and, therefore, should be required reading for anyone practicing ophthalmology. Foundations of Ophthalmology includes giants such as Young (the nature of color and light), Braille (a practical reading system for the blind), Helmholtz (development of the ophthalmoscope), von Graefe (defining glaucoma), Curie (discovery of radiation and the basis of radiation therapy), Gonin (demonstration how to cure retinal detachment), Ridley (serendipity that led to intraocular lenses), and Kelman (development of phacoemulsification that revolutionized cataract surgery).